Studying natural history is about discovering objects in the natural world and translating their meaning into scientific knowledge. “Whales: From Bone to Book” traces the journey of how Smithsonian scientists study the largest and most intelligent mammals on the planet: whales. The exhibition describes how the bones and fossils of these animals make their way from discovery on a beach or in rock strata, to the museum’s doors and into its vast collections, and finally to sharing new knowledge about the natural history of whales, past, present and future. Sketch of a Basilosaurus skeleton. Whales are among the unlikeliest of mammals: Their ancestors lived on land, but they spend 99 percent of their lives underwater. Scientists still have much to learn about their natural history, even as humans have hunted many whale species to the brink of extinction. 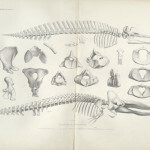 The Smithsonian has been studying whales since the 1850s, and its collections of modern and fossil whale specimens in the National Museum of Natural History are unmatched in the world. 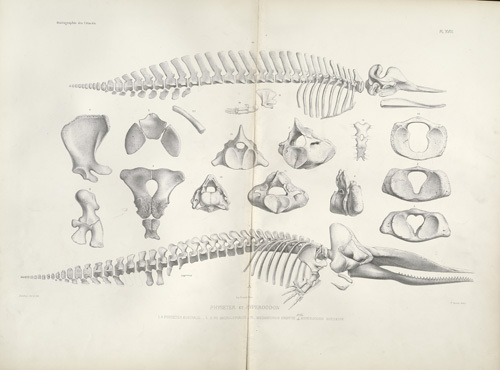 Teams of Smithsonian scientists, researchers and illustrators continue this legacy of investigation, collecting whale bones, placing them in the museum for study and publishing their findings. 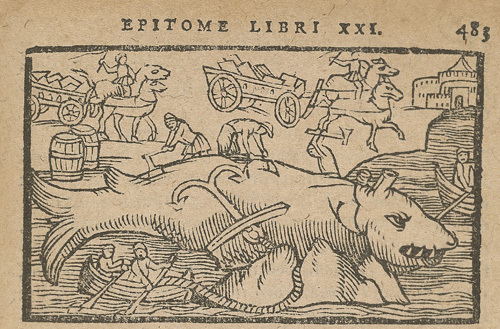 The Smithsonian Libraries is part of this process, housing the world’s best collection of resources about marine mammals – from centuries-old books to electronic journals that publish the latest discoveries by Smithsonian researchers. This exhibition showcases Magnus Olaus’s Historia de gentibus septentrionalibus (Antwerp: 1557), Johan Jonston’s Historiae naturalis v. 3: De piscibus et cetis (Frankfurt: 1650-1653), Conrad Gessner’s Nomenclator aquatilibus animantium (Zurich: 1560) and Pierre-Joseph van Beneden and Paul Gervais’s Ostéographie des cétacés (Paris: 1868-1880). Also highlighted are the graphics of Smithsonian scientific illustrators past and present, including Elaine R.S. Hodges, Sydney Prentice and Mary Parrish, and objects such as an illustrator’s tools, a printer’s block of an ear bone illustration, hip and thigh bones of the fossil whale Basilosaurus cetoides, the original specimen of the recently discovered Bohaskaia monodontoides and the Smithsonian Digitization Program 3D Lab’s documentation of a fossil whale site found in the Atacama Desert of Chile in 2011. Accompanying this exhibition is a symposium, “Whale Research at the Smithsonian: Past, Present and Future,” in the National Museum of Natural History June 6. The event is free and open to the public. 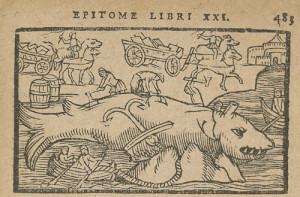 For more information, visit http://library.si.edu/events/whales-symposium.